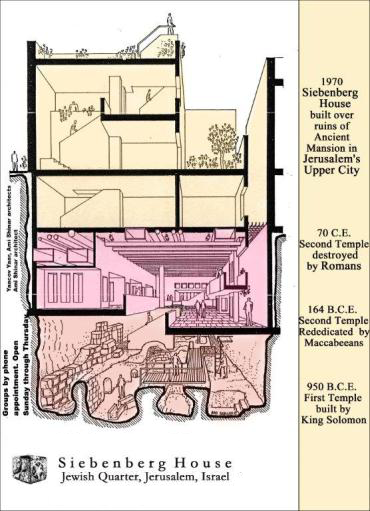 The founder of Siebenberg House museum, Theo Siebenberg, moved to the Old City of Jerusalem in 1970 and started excavating underneath his home in order to fulfil his life-long dream of finding an inextricable link between the Jerusalem of today and the Jerusalem of nearly three thousand years ago. In the cultural offerings of Jerusalem, Siebenberg House represents a continuum of millennia of Jewish history. Archaeological excavations carried out underneath the Siebenberg home over 18 years have revealed fascinating remains and artifacts dating back to the days of King Solomon and the Second Temple period. The museum has received wide publicity in major international media, such as The New York Times, National Geographic Magazine, and numerous other publications. Over 60 video documentaries have been produced regarding the site, among them the National Geographic one-hour special “Jerusalem: Within These Walls” (1986). Excavators found jewelry, glassware, armaments, pottery, an insignia of a Roman high officer’s rank, and other objects beneath the Siebenberg home. In addition, they found ritual mikveh baths and an ancient burial chamber. Some of the finds point to striking coincidences: a Czech machine gun, apparently the only one in the hands of the defenders of the Jewish Quarter in the 1948 War of Independence, was found in the same week that an arrowhead evidently used to defend the city against the Babylonian invaders nearly 2,600 years ago was discovered. Apparently, part of the Maccabee palace lay exactly underneath the Siebenbergs’ twentieth-century home, forming an inextricable link between modern Jersualem and its past. Siebenberg House offers a fascinating slide show, which is followed by a guided tour of the excavations in a variety of languages. Special events and harp recitals can also be arranged in this unique setting, which is interwoven in the scenery and history of Jerusalem. Jewish life, thus embedded in the very bedrock of this unique venue, offers a new dimension of continuity for a visit to the Eternal City of Jerusalem.